Sometimes I feel like a stressed-out comic book super hero, juggling multiple identities. Public opinion vilifies my kind, because people imagine that my kind spits venom or have two heads. The so-called public fears what it can’t comprehend. It’s as if people, collectively, have their fingers in their ears while yelling “lalalalala, I-can’t-hear-you,” but once you connect with them individually, one by one, they become open-minded, curious, smart… empathetic. I guess I should be inspired by Superman, arguably the most accomplished of all “illegal aliens.” Literally, in his case, as he came from another planet as an infant because his parents wanted to give him a better life when his home world was annihilated. He landed on earth and was raised in the Midwest by a loving couple to become a symbol for truth, justice and the American way. Last time I checked, he was still working at the Daily Planet, getting by under the name of “Clark Kent.” I hope that the e-verify system doesn’t catch up with him someday; where would ICE deport him? I’m no Superman, but sometimes I feel that’s about where the expectations are set. I’m the oldest of four and like any other first-generation immigrant child, I am the chosen one, the one who is supposed to bring balance to the force – er, to the family I mean – by overcoming adversity, getting a college education and a well-paying job. I’m the one forever cursed to translate for my parents so they can navigate a foreign system. You can imagine how disappointed my parents were when they figured out I wanted to be a writer instead of a doctor, teacher or police officer. I graduated high school in 2002 with suicidal tendencies because, as a band by that name sings, “all I wanted was a Pepsi.” That is, I wasn’t asking for a lot, I just wanted what everybody else seemed to have. It’s no joke – I’m not just saying I wanted to kill myself to be all “emo.”I was horribly depressed because all I had to look forward to in life was selling hot dogs, fruit and shaved ice in a cart my dad owned. Not to mention that a decade of internalized oppression and instilled fear of La Migra traumatized me. Unbeknownst to me, 2002 was the same year Assembly Bill 540 passed, which allows me to pay in-state tuition at a college because I’m a California high school graduate. I didn’t know about this law until I was handed an affidavit at East Los Angeles College in the fall of 2005. 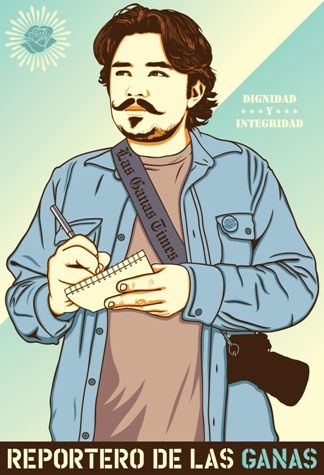 I became a journalism major, “el reportero de las ganas.” Slowly but surely, I was begging to find others like me. I read articles and saw their videos online. Tam Tram was the first undocumented student I ever saw speaking out openly – undocumented and unafraid. She gave me the courage to stop feeling bad for myself, to make the best of the situation and carry on. I wasn’t alone anymore. I began finding more and more undocumented students as I shared my struggles online through blogs. I discovered group after group that was organizing for our rights and the DREAM Act. I finally had a place to belong, and friends that understand what it’s like to grow up as an undocumented American. I share my story regularly with high school kids because I know my words will resonate with others who are undocumented and afraid. I let them know they’re not alone and that things will get better if they continue their education. Despite lack of legal status, no one can take away our education. It may not be easy, but we won’t be alone anymore and we will never give up the fight. Erick Huerta is a journalism student at East Los Angeles College, DREAM Act activist, and community reporter for “Brooklyn & Boyle,” www.laeastside.com, www.lataco.com and his personal blog www.justarandomhero.blogspot.com.